Holiday Park Hypnosis shows many of you know I perform at a few Holiday parks over the summer season and its a great way to catch a fun show and usually these are free entry events. 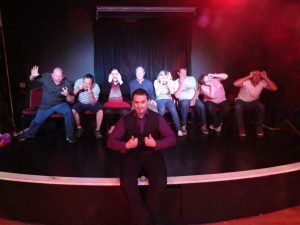 The show is a family-friendly comedy hypnosis show and although the volunteers must be over 18 the show is fun for all the family. Great fun using just everyday peoples imaginations we take the ordinary and turn them into the stars of the show, good clean fun that will leave you laughing and talking about for weeks after. You can see me every Sunday during the holidays at Whitemeade Forrest Park Click here this is a great location and such a nice park. there is always so much for the family to do and “Polo” is the host with the most keeping everyone entertained until show time. You can also catch me at Makis Leisure in Bridlington Click here this show is usually held on a Thursday check website for details or check out my facebook events. I am one of the ONLY hypnotists the specialise in Holiday park hypnosis show and have full DBS clearance as well as FULL liability insurance. Good clean fun that will have all the family laughing and talking about their holiday for years to come.